You would think that with 18 slots in my watercolour palette it would be easy to pick colours to fill them. But it’s not. Even after I made my final decisions, I changed my mind, leaving my palette sketch looking something like a flow chart. I’ve been wanting to make some changes for a long time but I hate wasting paint so I had to wait until I used up most of what was in the wells first. The biggest change is that I have taken out Sap Green. The only green in my palette now is (single pigment) Phthalo Green. You can see from the mixes below that with Phthalo Green plus the blues and yellows I have, I can mix a huge range of greens, everything from yellowish spring green to deep, dark pine tree green. Another big change is that I switched from the coolish Azo Yellow to a more neutral Hansa Yellow Medium. Many of the colours on my palette are from Daniel Smith, but the only Burnt Sienna I will use is Winsor Newton. My Permanent Alizarin Crimson is from M. Graham because it’s the brand that I find the most saturated. I am still looking for a great sky blue. I may have found it with Sennelier Cinerous Blue which may replace Cerulean Blue Chromium. I’ve also added Quinacridone Rose which is great for flowers and also for mixing with Phthalo Blue to get a great purple for shadows. I change colours in my palette often, so next month this may be different. Colour is very personal and there are no rights and wrongs with colour. It really depends on what you are most comfortable working with. Also, I am in no way a colour scientist, but this summer I met someone who is. Jane Blundell has an encyclopaedic knowledge of watercolour pigments, and by sketching next to her for an hour (at the Urban Sketchers Symposium) I learned more about colour than I have in all my years of painting. She has an excellent website and if you are interested in colour I suggest you check it out. I consult her site often and I am indebted to her for doing all the research she does with pigments and mixes. Below are some of the greens that I can mix with this new combination of colours. I love having lots of variety in greens and my favourite mix lately is Phthalo Green and Burnt Sienna. The result is sort of an olive hue that’s quite beautiful. One warning for when you make this mix: if you are painting trees or foliage make sure the Phthalo Green is well blended into the Burnt Sienna because there are no greens in nature (that I know of) that look like pure Phthalo Green. Thank you so much for this posting. I’m always struggling with my greens and often resort to Sap Green as I seem to so inept at mixing a decent green on my own. I really appreciate you showing the colours you have mixed. It’s the old story, a picture is worth …. Thanks for writing Sheila. I have the same problem as you. I always dip into the Sap Green but I find it gets monotonous, hence the palette change. I’m glad the post was helpful. 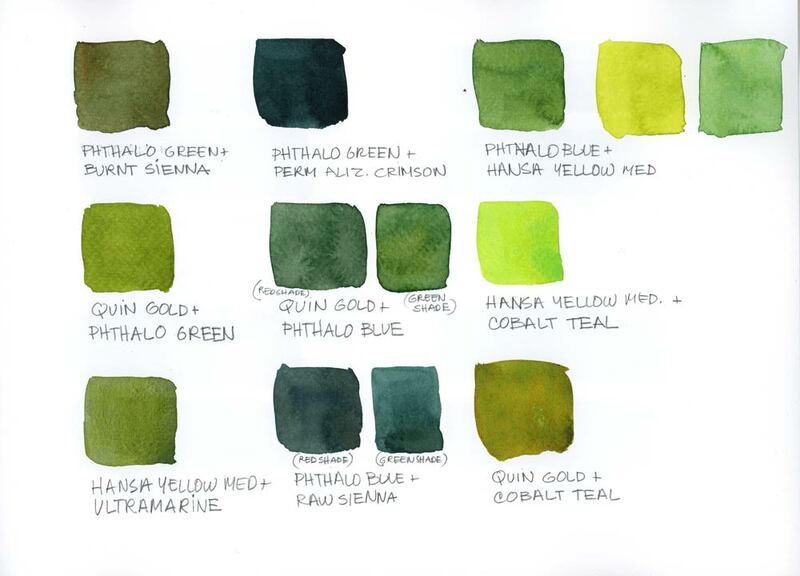 Thanks Shari for sharing your current palette…especially the tip on mixing greens…my favourite color! I’m glad it was helpful Holmar. I found your post very helpful as I also struggle with greens. I am curious, though, as to why you prefer Winsor Newton Burnt Sienna rather than Daniel Smith. I also follow Jane Blundell’s website and I know she is a strong proponent of using PBr7 for Burnt Sienna. Your thoughts, please, if you don’t mind sharing. Hi Dory. Good question. I find the Daniel Smith Burnt Sienna very dull and brownish. The Winsor Newton version is much more orange and brighter. I prefer it because I paint a lot of brick in my city scenes and I find it makes the brick look better. It also combines so well with Alizarin Crimson for reddish foliage in the fall. This not referring to your palette choices – which are intriguing and I want to play with – but to a book suggestion. I have loved following your blog about the Singapore Symposium as well as other sketchers and the Teoh videos on Youtube. I just read a very funny, but with a genuine heart to the story also, book that is set in Singapore and I feel you may particularly enjoy due to the setting. It’s ‘Crazy Rich Asians’ by Kevin Kwan published in 2013. Of course I recommend this to all your readers as a pure pleasure read. Now back to the color mixes. HI Lynn. I love book suggestions! I wish you would have sent me this before I went to Singapore when I was looking for books set in the city. But it’s not too late. I will see if they have this in my library. Thanks so much! Sorry about the timing but I only read it this week. I got my copy from the library in the audio version with one narrator but a million character voices – so well done that it acted as a performance as well as a book. I even love the way you print..I still have my palette that Helmut Gerth made for our class..did you know him? I will post the palette one day.I still use it. That’s funny Monique. He was my first watercolour teacher when I was 12 years old. I would love for you to post that palette. I’m sure it will seem very familiar to me. And you might be interested to know that I visited Hachem today. Nice store! And they had a great stock of Daniel Smith colours. Thanks for telling me about it. Oh how fortunate you are to have started art at 12 and with him.. I took 3 lessons..I loved them..I will take photos and post.. I really like the store also..too much. Hi, Shari. I enjoyed seeing your palette choices and your mixed greens. And I second your enthusiasm for Jane Blundell. Her website is an incredible resource for all things watercolor. I’m taking her online Mastering Watercolor course and highly recommend that too! Thanks for letting me know about the class Susan. I will have a look. Glad to hear that you enjoy Jane’s website too. Another great sky blue is Holibein Irodori Antique Turquoise. (PB17) It’s a sky blue version of Pthalo blue that looks very similar to Manganese blue. It’s a great intermediate blue between Pthalo and Cobalt Teal. The Holbein paint is the only commercial watercolor on the market that uses the pigment. I love it! Thanks for the recommendation for the paint. I’ve never seen that line of Holbein paints, at least not in Montreal. I love Manganese blue but it’s such a runny colour that I never add it to my palette. I’ll have to look for these paints online now. Some DS pigments are very runny – I’ve not used their Manganese Blue but can imagine what it’s like if it escapes! Some other options that Jane has probably explored but you might like to look at are Schmincke’s pigments 479 (Helio Cerulean), 499 (Cobalt Cerulean), and 475 (Helio Turquoise). I don’t think there’s any one blue that will meet all needs as the sky colour changes with latitude and season. Winter and summer skies are quite different. Find one (or two) that suits your situation. The “old standby” of W&N Cerulean Blue obviously met the majority of need for the traditional English landscape painter, but if you read their comments after they have visited and painted in Italy or Africa or other ‘foreign’ climes they rave about the different light and the sky colour, so they noticed the difference! Thanks for all your thoughtful comments Leigh. I agree with those English landscape painters. The Winsor Newton Cerulean is still the best for me, although I have been giving other brands a try. I have never tried Schmincke paint but I have heard many favourable comments from other people who use it. So much to try out there! This was very helpful!! Shari, would you have a book suggestion to help me sketch buildings better for when I paint with watercolor? I love your work and have admired you for quite awhile. I continue to revisit the crafter landscaping class I purchased! HI Melanie. I have a book recommendation but I don’t have a copy yet but I’m sure it’s good. It’s called “Archisketcher” and it’s by Simone Ridyard, an urban sketcher from Manchester. I saw a copy briefly in Singapore because I am one of the contributors but I didn’t really have time to read it. At first glance it looked great. Glad you like the Craftsy class! Have you ever tried Cerulean by m.Graham? And I was also very disappointed by Daniel Smiths Burnt Siena, it is so monotonous and flat. I wish I had read this post before I ordered it! But there is one thing I would really like to know: the quin Gold and the Raw Siena seem very much alike to me, why do you really need both? Good question! I have both in my palette and keep prevaricating about keeping both. I think a good Raw Sienna is invaluable for landscape painting where the Quin Gold is sometimes just too vibrant and orange. I have some Schmincke Translucent Orange which is pretty powerful in itself and I’m staring to experiment to see if I can use that to “invigorate” the Raw Sienna when I need to and so do without the Quin Gold. If you’re more into urban images then the Quin Gold is probably more useful as you’re not looking to replicate earth tones so much. Hi Isabel, I have tried Cerulean by M.Graham. I think that my favourite is still Winsor Newton and I may just go back to that. As for your question about Raw Sienna and Quin Gold. Raw Sienna is a very light pigment. I use it for warming up skies along the horizon line and also for painting sand (mixed with violet it gives a great sand colour). Quin Gold is much more potent. Although it may look similar in my swatch, it is actually very strong and I use it often for foliage and for dark greens. It works much better than a paler yellow. Paint with it at full strength and you will see what I mean. Thanks Shari for showing your choices for your palette and the chart of green mixes. I always enjoy seeing the different paints that you choose along with brushes, paper, and pens. You save me a lot of confusion! Thanks for writing Linda. As you can see by the comments, colour choices are very personal! Really great info – Thx! Hi Shari, I was really interested to read of your decision on green pigments. When the 5ml tubes of DS watercolours reach Australia (in the next month, hopefully) I’ll buy a small tube of Phthalo Green and experiment. At the moment I have three greens! Sap Green (of course), then Olive Green and Undersea Green which is actually a great base colour for our blue/grey eucalyptus foliage out here. I’ve also got a tube of Green Apatite Genuine which is interesting but I think it’s a speciality colour and not one for general use. Heavy granulation and black specks of the mineral limit its application. I also recently took Aureolin out (a bit too cool) and replaced it with Hansa Yellow Medium. I’m undecided about Alizarin Crimson. It’s a very useful and traditional colour but Jane Blundell says it’s ‘fugitive’ in that it will fade and so my reds are currently Pyrrol Scarlet, Quinacridone Rose and Brown Madder (W&N) which I find great for our red desert country. I don’t like the DS Brown Madder. I’m still making up my mind about Alizarin Crimson versus Quin Rose. In the blue range I found that French Ultramarine is deeper and more intense than plain Ultramarine in the DS range which I think is too close to Cobalt Blue to justify both. Phthalo Blue (RS) when sufficiently dilute makes a good substitute for Cobalt Blue, and Phthalo Blue (GS), again when dilute, can substitute for Cerulean Blue.However, the Phthalo pigments seem to have have no granulation and sometimes this can be a disadvantage and they’re very strong so require extra care in mixing. The answer seems to be in mixing a wash of the Phthalo pigment first and then add any other pigments to that. Add the Phthalo last and you risk overdoing it. The DS Cerulean pigments are interesting. I found the W&N Cerulean Blue to be much more to my liking than the DS version. I have been using the DS Cerulean Chromium for some time and like the granulation it gives but it seems a ‘dirty’ blue compared to the W&N pigment and for both those reasons I don’t like using it for skies at all – they look unnatural. For water, though, the slightly darker tone and the granulation can work very well. Thanks for your thoughts Leigh. Once again, colour choices prove to be so personal. And require lots of thought and experimentation. Have you ever read any watercolour books by David Lyle Millard? His standard palette includes 40 colours! You might enjoy his process too. Very loose sketches filled with luminous colour. Thanks for sharing all this about colour ! It is so important to understand it. It is helping me a lot ! And also Jane Blundell website. Have a nice weekend. I am glad phthalo green is working for you. The greens are gorgeous. The other colours you are looking at are interesting. I’d suggest you keep the German greenish raw umber as it is so useful to have convenient darks in your palette. The W&N version of raw umber is much lighter and weaker and is an easily mixed hue (quin gold and a touch of purple) so not as useful. I like the DS raw Umber for this deep cool brown too. In your palette you don’t have a red earth (like Indian red) and the easiest way to make that hue is your warm red and phthalo blue. It is worth testing whether phthalo blue GS or RS gives you the best venetian red, indian red, red light hues when mixed with organic vermilion. You have a lot of warm blues so I think switching from phthalo blue RS to GS could be a useful change. You can always mix the red shade hue with phthalo blue GS and a touch of Indanthrone blue, though you could equally make the RS into GS with a touch of Phthalo green if you keep the Red Shade version. For blue skies I always mix Cerulean Chromium with Ultramarine, rather than just using one pigment. Anywhere in the world this mixture seems to work as you can make it warmer or cooler, darker or lighter as needed. Both are liftable colours so you can quickly lift out fluffy clouds if desired. Hi Jane. I’m so glad to hear from you and happy to read your suggestions. Isn’t it amazing what a great discussion can be started when colour is the subject? I’m sure you get this all the time. I did try your suggestion of Cerulean Chromium with Ultramarine, and it was was better, but I have to admit I still prefer WN Cerulean. No, I don’t have a red earth colour, that’s true. When I was in Utah last year I added it, thinking it would be great for the red rocks. It was like painting with diluted pottery clay. I disliked it intensely. I am not really happy with the choice of Organic Vermillion. It’s too close to the Pyrrol Orange. I don’t like Cadmium red either but I may go back to that. Any other suggestions? I’m very happy I added Quin Rose though. I need a pinkish colour sometimes. WN Cerulean is softer and less opaque than Cerulean Chromium. 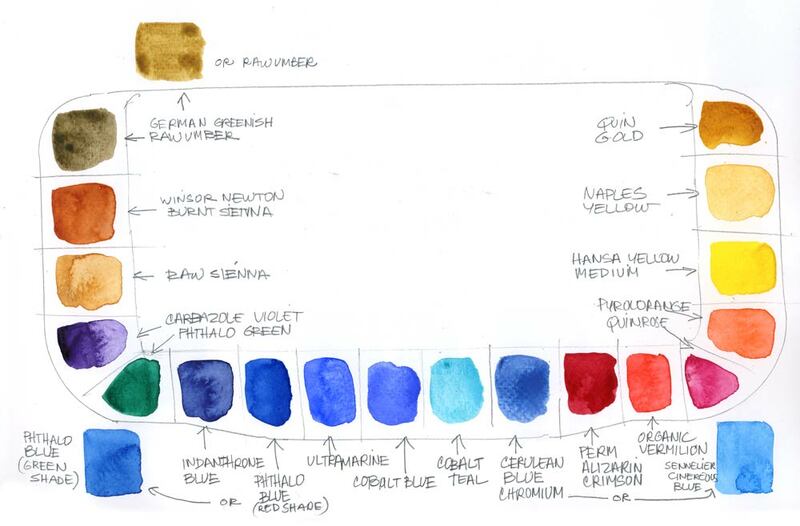 I have added a whole lot more watercolour swatches to my website and separated them by pigment so you can see an amazing array of the blues and greenish blues that are made using PB35 and PB36. Blockx have 4 variations using those pigments. Another alternative to Organic Vermilion is Pyrrol Scarlet DS – it’s a bit stronger, though so similar in hue that it may not be a big enough change. (It’s so useful to be able to test using those dot-cards!) It certainly mixes with Phthalo blue GS to make all the red earth colours – without the pottery clay feel. Pyrrol Red is a definite fire engine red that would sit between the orange and the crimson but you’d need to test how it mixes with your blues.I think a warm red is more useful than a mid-red. Or switch to a less red orange to spread the gamut? The important test of an orange is how it neutralises with your blues. It should make a huge range of burnt sienna, burnt umber, grey and indigo colours with ultramarine and cooler raw umber and cool greys with phthalo blue GS. Pyrrol orange is pretty much a bright mid-orange so I think it would neutralise well. Why don’t you make your own burned Sienna, Jane? Powder colors: blue, jellow and red are necessary. Thankyou Shari; a very generous teacher. I love Sap Green. Usually I would mix it slightly with other colours to make it less monotonous. The green is just too clean and I can’t resist using it. As for DS Burnt Sienna… Hmmm. I’m using the Italian Burnt Sienna and I feel the same way too. Maybe I’ll switch to using WN’s version as well after I finish the big tube I still have. I also find that WN’s French Ultramarine to have more beautiful granulation. I’m leaning toward Parka’s idea. I’m also using DS Italian Burnt Sienna but have just ordered a 5ml tube of W&N to try out. The DS pigment always looks a bit ‘dead’ to me. I have been using W&N Professional French Ultramarine (in the silver tube) for some time and find it an excellent product. The other one to try is Transparent Red Oxide by Daniel Smith – a gorgeous granulating burnt orange burnt sienna option that can be a bit wild but is a wonderful colour. Well, I’ve just run a quick visual test which seems to indicate the following. If you’re torn between Raw Sienna and Quinacridone Gold (as I and others have been) a good substitute with better mixing options is to continue with the Raw Sienna but tweak it with a dab of Schminicke Translucent Orange That way you can keep the (very useful) Raw Sienna but can make a mix that is very close to Quinacridone Gold or anything in between. The other thing I tested was the W&N Professional Burnt Sienna. I found it to be a richer colour, making the Daniel Smith version look flat and dead by comparison. Again, the DS pigment can be livened up with a careful addition of a small amount of the Schminicke Translucent Orange but it doesn’t compare as well with the straight W&N BS. I tried the Transparent Red Oxide a while ago (I still use Transparent Brown Oxide as a Burnt Umber replacement) but for painting the Northern Territory and the Kimberley I preferred the W&N Brown Madder. Seems to be a better match for the landscape colours up there. I will try it out from the “dot” sheet I have. And now I see that there’s one with your name on it too. How exciting!! I thought DS Transparent Red Oxide was going to be my pigment of choice for red rocks in Central Australia but I recently gave away a full tube of it in preference to W&N’s Brown Madder, so it might be worthwhile to check that out too – pity W&N don’t do “dot” cards, although I hear on the grapevine they might be about to start something like that. The DS Brown Madder is a very disappointing colour compared to the W&N – a bit like the comparison between the two varieties of Burnt Sienna! I tried the DS Italian Burnt Sienna and it is very much like the WN Burnt Sienna. More yellow, less brown than regular DS Burnt Sienna. But since I have WN and am happy with that, I will keep it. Yes, WN French Ultramarine is very beautiful for granulating and for mixing grey. I hope you are not too affected by that awful haze hanging over Singapore. I have a friend who is visiting this week and she is wearing a face mask in all her photos. Thanks for sharing Shari – I am always interested in people’s palette choices. My favourite sky colour for Australia is Manganese Blue. When I want a heavy looking blue sky I use Cerulean but when it’s feathery, I love Manganese Blue. Thanks for writing. I just read someone else’s comment about my current post and the problems people are having with runny colours in their palettes. Manganese Blue is one of those colours. It never seems to dry. I do like that colour but took it out of the travel palette years ago for that reason. Nice to hear how you use it. I’m in two of your Craftsy classes & today fixed a palette like yours (staying still because of bronchitis) & want to paint along some from the outdoor class. I’ve enjoyed reading all the comments & I think your Craftsy classes are fantastic. What a great close-up way to learn. Hi Nancy, It’s so nice to hear from you. So glad you like the classes on Craftsy. It takes a lot of work to put these together but it is so satisfying to hear that people enjoy them and learn from them. Hope you feel better soon and get some time outdoors to sketch as well.